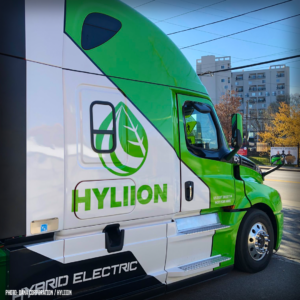 ATLANTA, Ga. – A Class 8 electric hybrid Freightliner Cascadia with the Hyliion e-axle, and a fully-electric Peterbilt 220 with Dana’s electric drive system were made available to the truck press for quick test drives during the spring meetings of the Technology & Maintenance Council. The hybrid-electric new Cascadia is essentially a conventional 6×4 diesel, converted into a 6×2 diesel with an electric tag axle. Energy is captured during braking and while descending grades, which is then stored and discharged through the e-axle – powered by Dana motors – when the truck is accelerating or climbing hills. This provides fleets with over-the-road fuel savings of as much as 12%, depending on route and terrain. Story by James Menzies / www.trucknews.com.